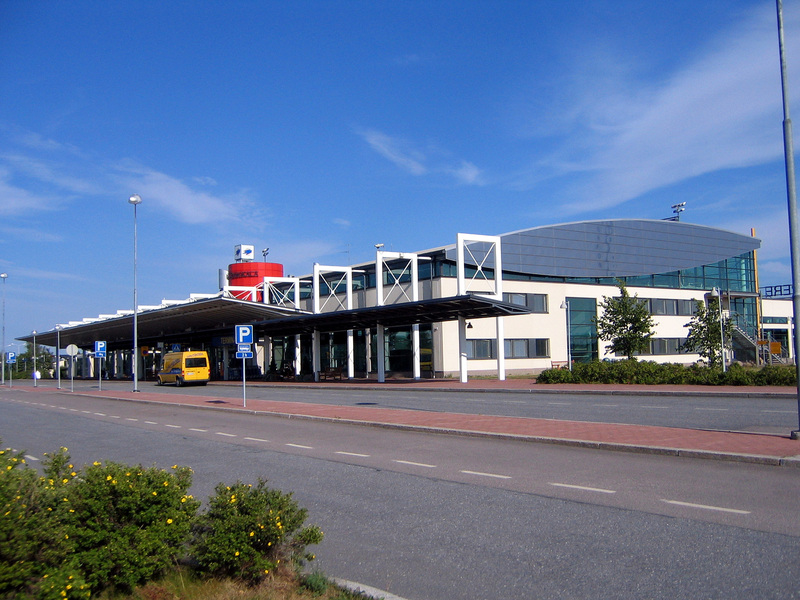 Tampere–Pirkkala Airport (IATA: TMP, ICAO: EFTP) is located in Pirkkala, Finland, 7 nautical miles (13 kilometres; 8.1 miles) south-west of Tampere city centre. The airport is the eighth-busiest airport in Finland, as measured by the number of passengers (208,930 in 2016), and the third-busiest airport in Finland, as measured by the number of international passengers (122,652 in 2016). 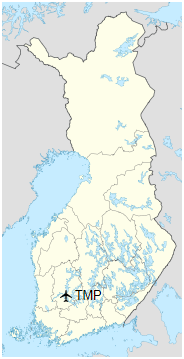 The airport is also home to the Satakunta Air Command base of the Finnish Air Force. F-18 Hornets were stationed at Tampere-Pirkkala airport until the middle of 2014 when the 21st flight of the Satakunta Air command was dissolved. Tampere Airport was founded in 1936 in Härmälä neighbourhood, locating 6 kilometres (3.7 mi) from the centre of Tampere. At that time the airport was connected to Helsinki, Vaasa, Oulu and Kemi by Aero O/Y (now Finnair). The first terminal building was built in 1941. Karhumäki Airways began to fly to Stockholm in the 1950s. The runway was paved in 1958. Between 1936 and 1979 Härmälä airport served 1.5 million passengers. 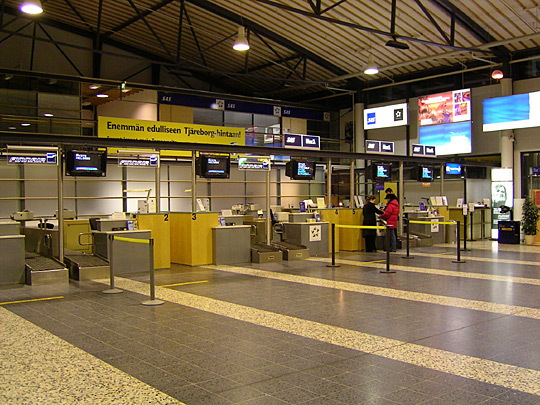 In 1979, Härmälä airport was closed and the new Tampere–Pirkkala Airport was opened. The current terminal 1 building was completed in 1996. 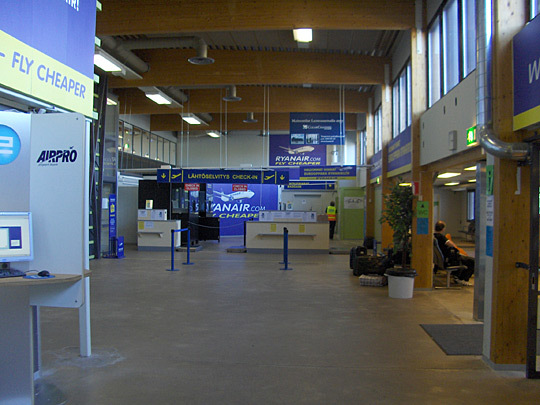 Ryanair started flights to Tampere–Pirkkala in April 2003. Its first destinations were Stockholm-Skavsta, London-Stansted, Frankfurt-Hahn and Riga. This made the airport one of Finland’s fastest-growing airports and increased its annual passenger numbers from 256,380 to 709,356 between 2000 and 2008. In 2011, Ryanair had 13 destinations from Tampere–Pirkkala. Wizz Air flew to Gdańsk during summers 2010 and 2011. airBaltic resumed flights to Riga in March 2017. 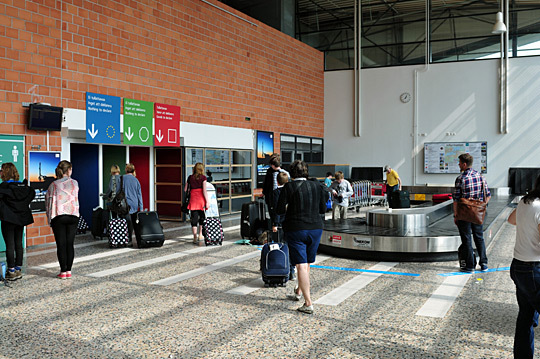 The low-cost airline terminal 2 was renovated in 2014–2015. However, in April 2015, Ryanair announced that it would cancel all the routes from Tampere for the winter season 2015–16 due to a plane shortage. Only routes to Bremen and Budapest have resumed in spring 2016. The airport is connected to the city centres of Pirkkala (8 minutes) and Tampere (30 minutes) by bus route 1A, which runs once an hour. The bus fare for a single ticket to Pirkkala is €3 (zones B+C) and to Tampere it is €5 (zones A+B+C). One can change to any other bus going anywhere within Tampere and parts of neighbouring municipalities within one hour from the purchase of the ticket. The buses on bus route 1A going toward the airport show the text «1A Pirkkala Lentoasema/Airport» on the front of the bus. Bus routes 1, 1B and 1C do not go to the airport. There are long distance connections to Helsinki and other cities via the Tampere coach station [fi]. The timetables can be found at the Matkahuolto web site. A taxi service is also available in front of Terminal 1.